Other items on auction include a hat worn by Bono, one of his leather jackets, another one of The Edge’s Gibson guitars, a worn pair of Edge’s Converse sneakers, his Popmart cowboy suit… and much more. See for yourself. It’s not his original one. The gold bits have faded to nickel on that one. This is my dream guitar. His guitar was the reason I wanted to learn. It is so original looking. 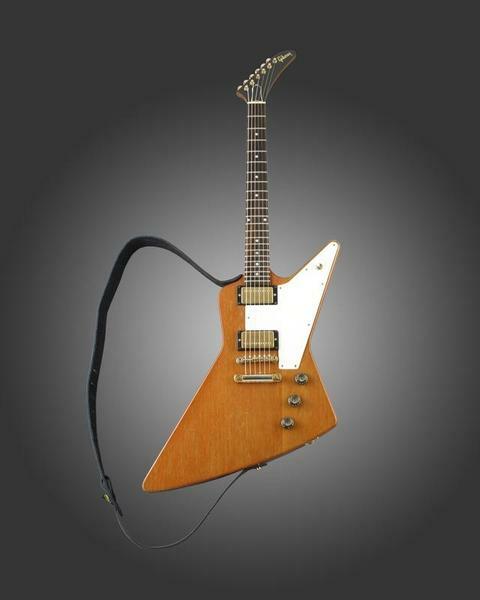 I wish I had the money to buy this guitar. I don’t care I am left handed or not. I’m gonna say this before it comes up: It is *not* the original Explorer that Edge got in the early days. It is a duplicate. So don’t freak out. it’s not even a duplicate, it’s just a more recent model than his main explorer. the one he’s giving away was supposedl used for miracle drug on the last tour… and yes his main explorer does have different hardware….